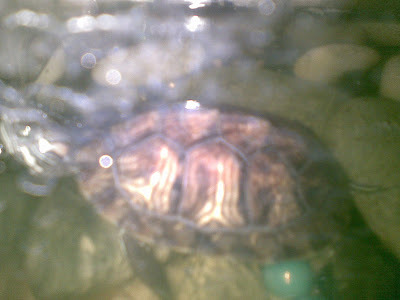 No kids for us but we have a turtle, and my, is he growing big! We didn't really expect Dex to get this big. His sister, Casey, died a few weeks after we got them. We thought that Dex would follow soon but he has overcome the odds! Take a look at that big boy. Talking of pets, I saw this cute dog in the elevator earlier when we went down to eat dinner (fastfood!). This building is "pet-friendly" and we could have a dog if we wanted one. Well, I do kinda want a dog but it is such a hassle to take care of one. I don't even know where we would put one, much more all the toys and other dog supplies that we will need. For now, Dexter should be enough. He's a good boy yes he is.